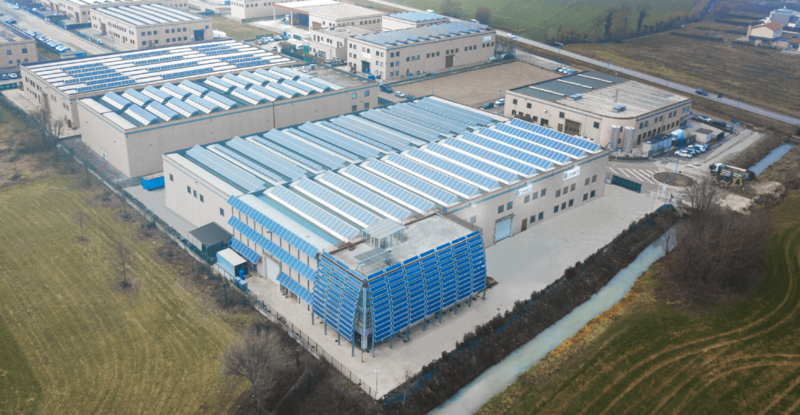 In 2018 the Italian brand continued its expansion, in january Ecoprogetti started a new production site in a modern building with photovoltaic integrated rooftop, and an amazing BIPV facade equivalent to 300kW of installed PV, this is a new production site with new spaces and more technological possibilities, it goes adding to the other production facility positioned along the same road, reacing a total of over 5000sqm of production space. The Italian team continues to produce state of the art machines and the company is optimistic about the future. Our goal is to remain the growth-oriented leader in the photovoltaic industry, providing innovative solutions, services, expertise and technologies that support our customers in their business and in the full PV process know-how. The new production site is totally dedicated to the production, assembly and testing of the equipment produced for the various markets. The Italian headquarter is the only Production site for Ecoprogetti, since all the subsidiaries are SALES & SERVICE offices with on-site spare part warehouse, but not production. Come to visit us in our new factory to discover our latest PV production solutions, you can find us at about 80km from Venice International airport, 87km from Verona airport and 220km from Milan airport.